Seems there’s been a recent scuttlebutt about one of our favorite breakfast cereals going away. Never fear, friends of the Cap’n. It’s all just rumors over a concern of kids and eating healthy. The Cap’n is not going away. 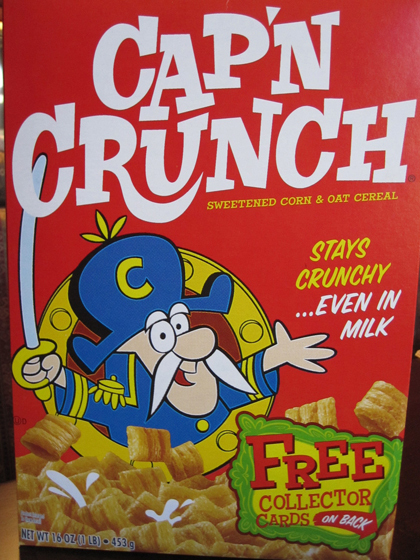 So go enjoy your favorite Cap’n Crunch [mine is Peanut Butter Crunch] and never fear, ye old swashbucklers – your Crunchberries will stay nice and crunchy. I’ve never liked Cap’n Crunch… but yay! -for everyone who does! We’ll always have Lucky Charms, right? I can eat it until the roof of my mouth is in shreds. I picked up some All Berries last week. My son claimed those as his own. I’m a fan of the original. But you know what I really miss? Quisp. Yeah, I get that if I eat it often enough (a few times a week), but lately, it’s been once every 10 days or so, which doesn’t seem to rough up the roof of my mouth too much. Quisp and Quake bring back some memories. I’ll be curious how you like it. It’s pretty sugary, but tasty. Damn. Now I am hungry for cereal. Thanks, Marty! Does this type of cereal every scrape up your mouth? That is what those cereals do to me. As I mentioned above to Lisa Golden, it does rough it up if I eat it often, but in spread apart doses, it’s not bad. My kids love all the Cap’N Crunch cereals. I bet right now we have every kind they make sitting in our pantry. Yay! A whole household of Cap’n Crunch fans. I’ve done that, too. It was always fun. Of course, every so often, they have the All Berries version of the cereal. Nom Nom. I like the original and Crunch Berries. I’m one of those that thinks peanut butter is only good out of the jar, in a sandwich, or as part of a Recee’s Cup. And you know they have a Reese’s cereal which is even more peanut buttery than the Cap’n Crunch version.